There are two common pH indicator dyes used to measure pH which we have tested with the colorimeter, Phenol Red and Bromothymol Blue. 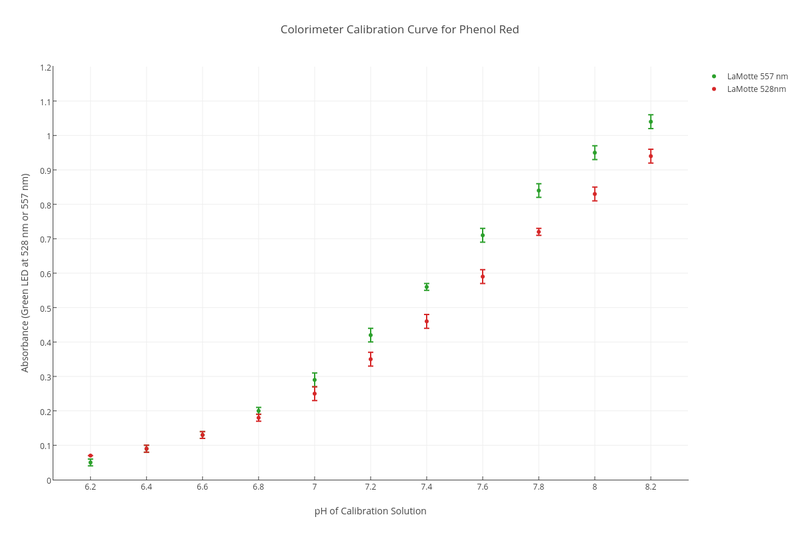 Phenol red indicator can be used to measure pH from around 5.8-8.2. The indicator changes gradually from a bright yellow to a red color which is measured at 557 nm. This is a fairly inexpensive and easy pH indicator to use. Bromothymol blue indicator measures pH from 6.0 to 7.6. Indicator changes gradually from a yellow to dark blue color which is measured at 615 nm (use the 625 nm LED on the colorimter RGB board). 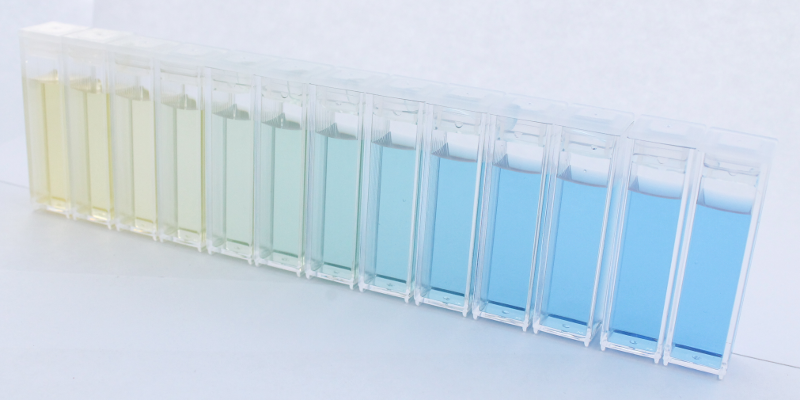 Bromothymol blue indicator is used in the API pH test kit. The indicator can also be purchased from several online stores. API pH test kit. $5 plus shipping for 37 mL via Amazon. I used this website as a guide for making phosphate buffers with a pH range of 5.8 - 8.0 (first set of testing) and later a range of (6.2 - 8.0). 0.2M Potassium phosphate: Transfer 13.61g of KH2PO4 into a 500 mL volumetric flask. Fill to the 500 mL mark with distilled water. 0.2M Sodium hydroxide: Measure 50 mL of 1M NaOH into 250 mL volumetric flask. Fill to the mark with distilled water. To make the pH range, labelled a set of 250 mL capped bottles and added the following volumes to each bottle. Measure with a pH meter to verify pH and adjust if necessary. Use a pH meter and either 0.2M KH2PO4 or NaOH to adjust solution to the desired pH e.g. 6.2, 6.4 etc. Max absorbance of the red color of phenol red is at 557 nm. The green LED on the RGB LED board can be used - this is 528 nm, so not optimal. Recommended to use the separate 557 nm LED board. Max absorbance of the blue color at 610-615 nm. Phenol Red has an absorbance max. of around 560 nm. 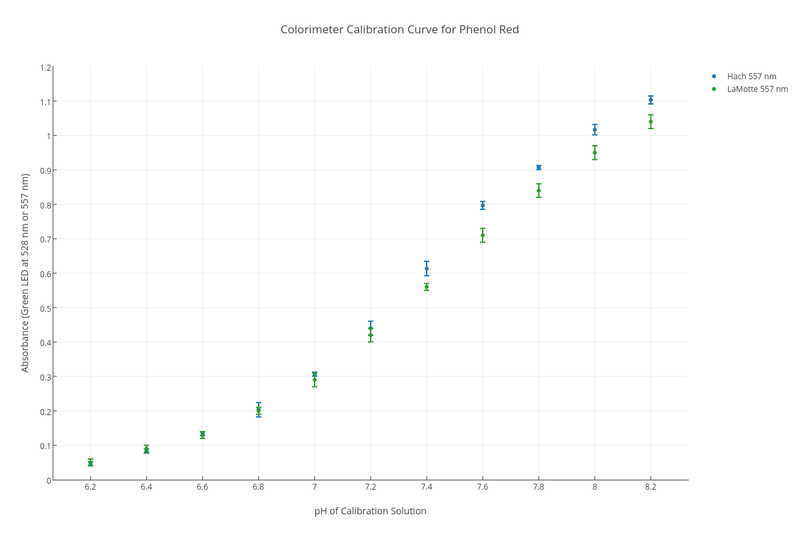 The green LED on the standard RGB LED board that comes with the colorimeter kit is 528 nm, which is not optimal for measuring Phenol Red absorbance. So, we also tested absorbance with the 557 nm LED. In these two graphs you can see the difference between the two calibration curves, with the 557nm LED performing slightly better. The standard green LED on the RGB board does also work quite well. 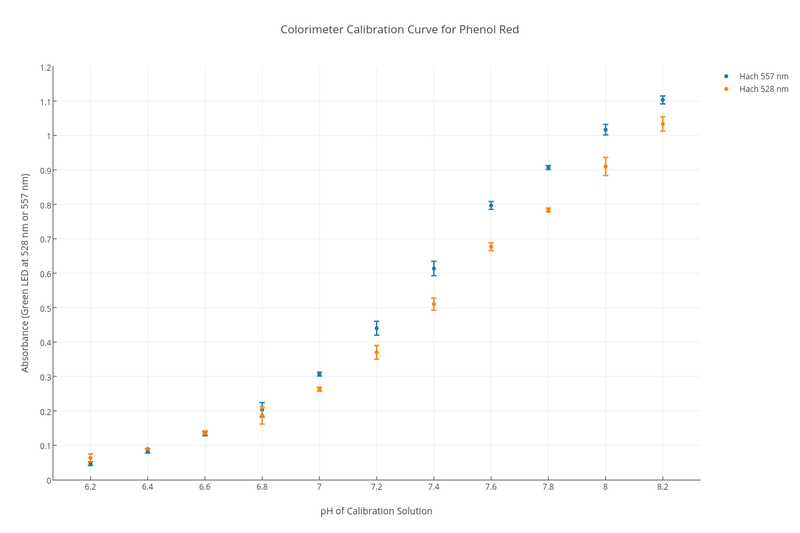 The two graphs below show a comparison of the calibration data from the two phenol red indicator solutions - Hach and LaMotte. They were measured using the 557 nm or 528 nm green LED. There was a noticeable difference in absorbance above pH 7.2, although below this they behaved the same. 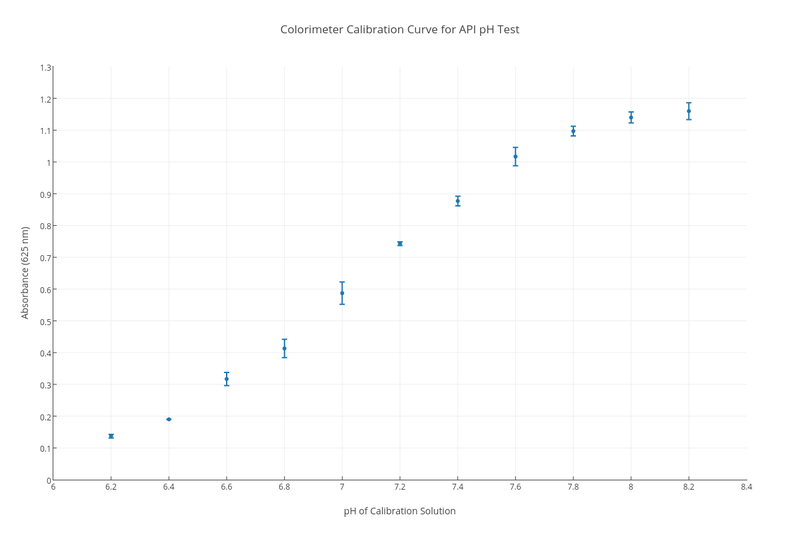 Below is calibration data from the API pH test. Absorbance was measured with the 625 nm red LED on the standard RGB LED board.